And "If you talk about a problem long enough, you may figure out how to solve it." 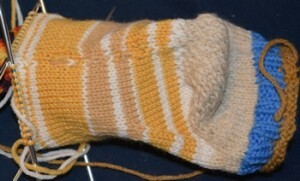 The yellow-striped sock that was laddering badly at the ends of rows starting about five or six rows back? The one I posted about earlier today, bemoaning the need to rip back all those rows? It's fixed, and without ripping everything back. You can see some uneven stitches (mostly two-yarn stitches, in the widest schoolbus-yellow stripebut also that it's still snugly together. I had to stuff it with an old mitten my mother had made me to get the relevant area flat enough to stay in focus. When I looked again, both at it and at the pictures, I realized that the problem existed only in that one small area, and that it looked, despite the correct stitch count on the needles, exactly like a stitch had taken off for the South Pole. What if, I said to myself, I could just drop a few stitches off one needle, let them run down that far, and then rebuild vertically? Surely it's worth a try, I said to myself, instead of frogging the whole yellow stripe and the white below it. So I did. And in violation of all reason, given the right number of stitches on the needles, there was a nub of a stitch...and by working some stitches back up, and grabbing not only every obvious ladder but anything that looked remotely loose, including the sides of oversized stitches, things came back in line (mostly) on their own. Connected again, and somewhat whonky looking, but not BAD. 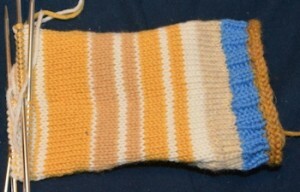 Mostly, it ws the stitches knit with two yarns where stripes began and ended, which are always large anyway. So I knit another row of the yellow to firm things up and see. There was still some slack somewhere and I could not see it (you really don't want to hear about the peculiarities of my vision as the result of age, astigmatism, myopia, a new lens in one eye and a cataract in the other...but there, you just did) so I turned savage, made another stitch out of something only slightly too long, and then knit that together with the stitch next to it. Had to do that again two rows later, but now...now there's some "scar tissue" of the fixup, followed by nice smooth knitting, including two stripe transitions that behaved perfectly. From other striped socks where other things went awry, I know that after a few wearings wonky bits on the bottom of the sock felt up, flatten out, and look good, so now that there's no structural weakness, I'm happy with it. I added the pictures Friday morning, when the light was better. No pics of the inside, because I'm not at a good place for turning the whole sock inside out. These will be cheerful socks when done. I may also be a cheerful-er knitter. Have you tried using a crochet hook to pick up ladders? It can reduce the rippage .... hook up the lost stitch/rows until you reach a suitable point for replacing on the needle or undoing down to combine the stitches. That's what I used. Sorry that wasn't clear. I pick up dropped stitches (when I know it's a dropped stitch) with a crochet hook. In this case, the stitch count being correct on the needles had convinced me it couldn't be a dropped stitch but something else, which I'd have to diagnose after ripping back. In fact, it was a dropped stitch, but dropped an unusual way. And I took relevant stitches (at either end of the ladders) off the needle to help find the original dropee, then hooked them all back up. When it still wanted to be loose, that's when I made a new stitch (with the crochet hook) and K2tog to snug things up and maintain the 13/needle count. Nothing was actually ripped back; I just dropped some intentionally to get a better view. Sorry to have given an incomplete description of what I did. Excellent! Nice job of knit-hacking. Good work! It goes to show, sometimes you just have to step back, give it a minute of thought (or "sleep on it", if you will), and take a different approach. I went on and deleted your anonymous comment since it was identical to this one. Thanks for taking the time to log in and post as yourself. Sleeping on it (I found it a day or two ago) helped, and so did talking about it online, which helped me get over the intense "Oh, no!!" feelings and thus--resigned to doing it the long hard way--actually look at it more analytically and see that it might be fixed by dropping another stitch or two so I could find the culprit or at least grab everything that looked at all loose with the crochet hook and see if that worked. With the backup plan of "OK, I will rip it all if I have to." And I didn't. It's funny how at first what turned out to be a fairly simple solution didn't occur to me at all...I was swamped in guilt (for making a mistake and not finding it right away), shame, etc., and so the sock looked worse and worse every time I looked at it. Hopeless. Would take hours of work if I could do it at all. Checking the stitch count and finding it correct should not have turned off the "it looks like typical dropped stitch laddering" observation, but it did. It became something strange, unfathomable, awful. In my mind the laddering went from a few rows covering just over half an inch to many rows covering several inches, and the ripping back threatened to destroy the whole sock. Exaggeration much? Yeah. Typical panicky thinking--dropped an egg on the floor, the whole meal is ruined. Photographing the damage suddenly made me see it more as it was. How many ladders? How wide was that stripe really? Not that wide. Not that many rows. What if (switching yarns back and forth, trying to carry the unused yarns and lock them in every few rows) I'd lost one of a double-yarn stitches and that had started the problem. Then the count would be correct, but there'd be a gap because the wrong color was picked up. Once I thought to try the "looks like a dropped stitch, treat like a dropped stitch" approach, I was home free. Feeling clever instead of stupid, careless, lazy, etc. Boy, those old messages have a longer lifespan than whatever childish mistakes led to the lecture. A good lesson, and one I personally need reminding of myself at times, heh. I am apt to criticise myself quickly, and feel utterly low at the ruination of wasted time and good work. I'm so pleased you found the other solution.